Ultimate Man Cave Garage Loaded with Awesome Muscle Cars!! Take a look at this Ultimate Man Cave Garage Loaded with Awesome Muscle Cars!! Ever since we were kids and we realized how much vehicles fascinate us, we have all (yes you too) imagined out dream garage. What kind of cars would it contain how many cars, what production models they would be, what kind of tools, maybe a couple of bikes, possibilities were endless. Somehow this guy has made his garage/man cave something that we would all like, and he even managed to fill it with cars that would definitely be on our list if we were lucky enough to have something like this. The car collection itself is stunning but he also managed to peak our interest with great movie memorabilia, weapons and even guitars, now this guy has some astonishing taste apparently and to bring us all the info about his man cave/garage today we have Patrick Nichols narrating the video showing us all that we need to see so play the video and tell us if it was something that you would have done differently in the comment section. True Street No Prep RACING – No Prep Mayhem! Insane 8000hp Top Fuel Burnout Car! 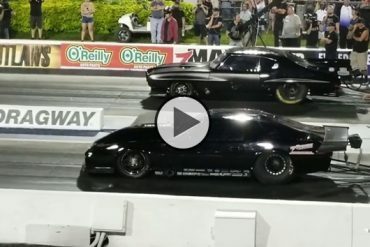 Previous articleBig Chief vs. Boddie In one hell of a race in Street Outlaws!!! Next articleAwesome Barn Find, a Soldier’s 1970 Boss 302 Original Owner!!! Street Outlaws Kye Kelley “Shocker” Against Murder Nova and Big Chief!